Despite heavy investments by companies, customers are frustrated with wait times and the experience provided by the call centers. Knowledge management is scattered across several sources, and users have a hard time finding the exact information they require. Customers and Channel Partners need immediate and accurate answers to their questions and technical issues. All the technical content is indexed and can be accessed with a simple free form search. Data can be further filtered based on brand, product category, model and other criteria. Brands can foster self-service by providing access to resources that customers need, without requiring assistance from an agent in a call center. Using My Customer Portal, brands can deliver rich content, documentation, and tools, making it easy of for customers to find relevant and helpful information. By making installation, training and support resources available online, customers can get help and service products on their own. Contact Centers are inundated with calls that could have been easily solved by simple access to relevant knowledge topics. Even when customers reach the contact centers, they are frustrated by the lack of knowledge of the support agents to answer their questions. Mize Support provides a Smart Panel with contextually relevant Knowledge for customers, field service techs and contact center agents. The most relevant topics are suggested by the powerful knowledge search engine using the product, Service BOM and issue description filters to help find resolutions faster. Enabling simple access to an aggregate of service knowledge hidden inside the various silos will satisfy many of the support requirements of the customers seeking information and the customer service organization that serves those customers. Using Mize Knowledge web services API, relevant knowledge topics can be presented to customers and Contact Center agents on any Support or Case management system. As products become more complex, having the relevant knowledge available at the point of service is critical for the technician to diagnose and repair the products accurately. Improve the percentage of the work orders that are completed during the first visit by enabling the technician to access operator manuals, service manuals, interactive schematics, illustrated parts catalogs, and work instructions that provide guidance toward diagnosis and service task completion. Any existing content in HTML, XML, PDF or other formats can be uploaded or published in Knowledge Manager easily. The publishing process can be automated from existing publishing and document management systems reducing the efforts and costs involved in making the latest content available to the users. Mize provides simple cloud-based subscription model (SaaS) for publishing and accessing all knowledge resources including Service Manuals, Service Bulletins, Parts Catalogs, Schematics, and other Knowledge assets in real-time. You can get going with your Knowledge solution with the responsive web and native mobile access within days with low upfront costs and a cost-effective monthly subscription fee. Mize Knowledge solution supports the content delivery in multiple languages. Some of the major languages supported include English, Danish, Dutch, Finnish, French, German, Italian, Polish, Portuguese, Norwegian, Russian, Spanish, Swedish, and Turkish. Mize Knowledge unlocks the potential of knowledge assets by simplifying access to all knowledge for all stakeholders. 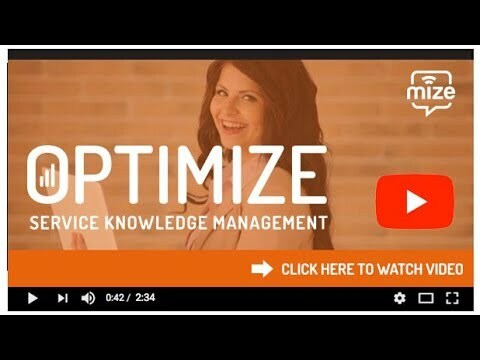 Mize provides the most cost-effective and easy-to-use Knowledge Management solution that can be deployed in the cloud within days and accessible on any browser or any iOS or Android mobile device online or offline in any language globally. Request a Demo to learn how you can enable and empower your customers and channel partners with Mize Knowledge.